Tutorials are small classes of seven to eight students emphasizingstudent-centered learning through discussion and debate, in contrast to the typical teacher-centered lecture format. Assigned a problem, students identify the relevant issues and topics and explore them through individual study and group discussions. The tutor (instructor) plays a supporting role, guiding the discussion to help students penetrate the issues more deeply. Through this process, students learn how to identify problems, study independently, debate the issues, and evaluate their own performance—all abilities essential to lifelong learning. Kyorin University Hospital on our Mitaka Campus has more than 1,000 beds and handles over 2,200 outpatients daily. The hospital’s Trauma and Critical Care Center, open 24 hours a day, treats roughly 40,000 emergency patients a year from minor to critical cases. Designated a regional cancer center in February 2008, the hospital plays an important community role as a major regional hospital for western Tokyo. Fourth to fifth-year students get real-life “bedside learning” experience in each of the hospital’s clinical departments in the course of their hospital practicum. In their fifth and sixth year, they develop their practical clinical skills by completing a clinical clerkship at the hospital, participating in actual patient care as a member of a medical team. three-day orientation, followed by a tour of the Kyorin University Hospital. 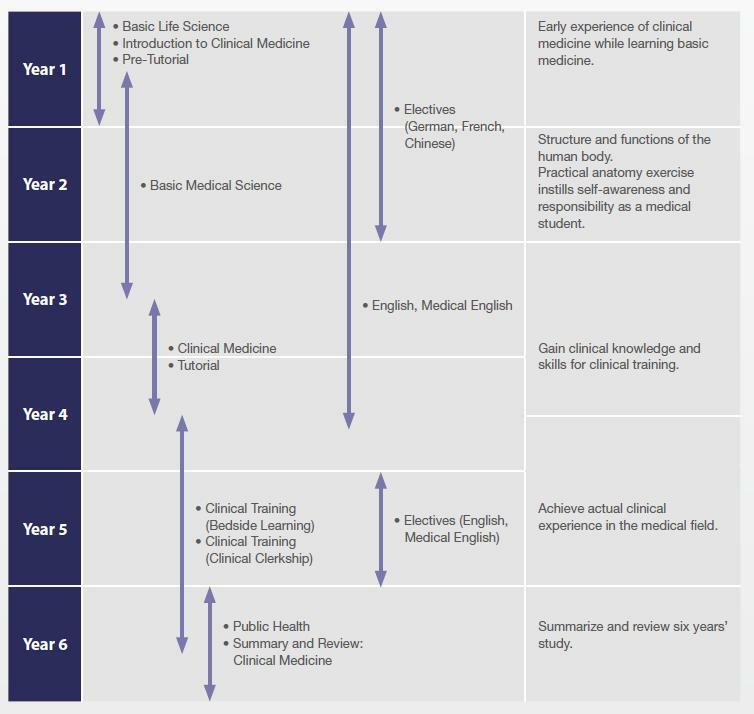 The study of medical science and introductory clinical medicine begins in year one. The first-year curriculum also includes basic life science, which provides a firm grounding in disciplines of natural science closely connected to the field of medicine, including biology, chemistry, and physics. From year one through the first semester of year three, the focus of study is basic medicine and social medicine. From the second semester of year three through the first semester of year four, the emphasis shifts to clinical medicine. From the second semester of year four through the first semester of year six, students take part in two years of hospital practicum. The second semester of year six is devoted to summative study and assessment. After graduation, students who pass the National Medical Practitioners Examination are eligible for a twoyear clinical resident training program at Kyorin University Hospital. They also have the option of entering the Graduate School of Medicine to pursue advanced studies in basic, clinical or social medicine.